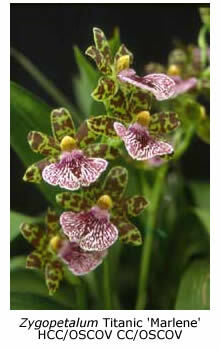 These cool-growing and highly perfumed orchids grow and flower in roughly the same conditions as cymbidiums. The Zygopetalum species (numbering about sixteen) come chiefly from Brazil and neighbouring South American countries. 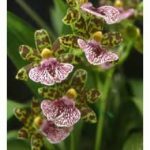 Most can be recognised by their distinctive green and brown petals and sepals and their striking mauve to purplish pink, striped lips. Zygopetalums have a delightful perfume which can fill a shadehouse on a warm day. Most carry four to eight large flowers on a long raceme. These are often produced twice each year and are long-lasting; some keep quite well as cut flowers. Zygopetalum Species. 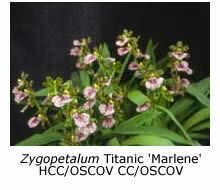 The more commonly grown species are Zygopetalum mackayi, Z.intermedium, Z. crinitum and Z. maxillare. All have been used in hybridising and a number of lovely varieties have been produced. While there is some confusion in distinguishing Z. mackayi from Z. intermedium, both are cool growers which flower from early autumn through to winter. They both produce a strong upright spike with large and prominent flowers. Z. crinitum is a smaller plant with smaller flowers that tend towards dark brown with considerable blotching on the sepals and petals, while the lip has purplish blue tonings. Z. crinitum flowers in early to mid-autumn. Z. maxillare differs from the previous species in requiring warmer growing conditions. It has medium-sized flowers with dark brown sepals and petals and a striking pink to mauve lip. For this reason it has been used in a number of the more recent hybrids. Zygopetalum Hybrids. Until recently there were few hybrid zygopetalums, reflecting a relative lack of interest by early growers in what is a truly beautiful genus. The first registered hybrid (1894) was Z. Perrenoudii, made from Z. intermedium and Z. maxillare. A number of new hybrids have been produced in the last 20 years and some to look out for include Z. Blue Lake, Z. Titanic, Z. Helen-Ku, Z. Warringal Wonder, Z. John Banks, Z. Artur EIle, Z. Kiwi Choice and some of the crosses made using Z. maxillare, such as Z. Sedenii and Z. Yolande. Some of the intergeneric hybrids such as Zygocaste (Zygopetalum x Lycaste) are also worth trying. Cultural Requirements. Zygopetalums prefer a cool, moist environment, similar to that enjoyed by cymbidiums. An open potting mix of well-weathered medium size pine bark is suitable, as is also any well draining and open cymbidium mix. While Zygopetalums tolerate low temperatures they appreciate some protection from the cold, wet days of winter. Provide a covering and keep the plants on the dry side over winter, as this approximates the rest period (time of least growth) in their natural habitat. Zygopetalums require bright light (50% shadecloth) but not strong sunshine, otherwise their leaves will burn. They also do well in an open, airy position, which reflects their natural epiphytic habit, growing either on tree branches or attached to ferns. They should be watered well during their active growth period in summer and appreciate small and frequent applications of liquid fertiliser. Leaf Spotting. 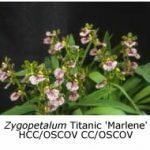 One of the problems encountered with zygopetalums is the tendency for the leaves to develop spots, while the foliage of other orchid genera grown side-by-side with them remain quite clean. These spots are difficult to avoid, although keeping the plants in an open, airy position and drier over winter may reduce the problem. Propagation. You can expand your collection by dividing larger plants or by striking backbulbs, either in normal potting mix or in a sealed plastic bag containing a little moist Sphagnum moss. However, single backbulbs are more difficult to strike than those of cymbidiums and as with lycastes, success is more likely using a clump of 2-3 backbulbs.